Chances are if you have watched television in the past five years, you have seen a singing Free Credit Report commercial. The two guys on the FCR commercials will sing about just about anything: pirates, dream girls, the renaissance fair, driving, spelling, and "stress." Even though you probably think these commercials are the most annoying thing on television besides Khloe, Kim, and Kourtney, the songs will usually be stuck in your head for days and days and you will be wanting more of these corny commercials, because despite their temporary annoyance they serve as a constant reminder that even commercial music can be fun, catchy, and semi-entertaining. The problem with the FCR commercials is that it is not accepted by the "learned folks" as the right way to make music. The "right folks" say that music is supposed to be a work of passion, a reflection of a human mind, a complex work of art, and something that introduces us to a new sound. This is why the FCR guys are supposed to be an insult to everything we consider good, wholesome, and lovely about music. We aren't supposed to connect to the FCR guys type of music because we would like to place ourselves on a pulpit. We only want to connect to music that is passionate, mindful, artful, and groundbreaking because the ultimate version of ourselves would be passionate, mindful, artful, and groundbreaking. King Charles is a more serious, structured, catchy, original, artful, and complex version of the Free Credit Report music, but still has the same general fun nature and fast pace that makes those songs get stuck in your head for days and days. They are a band that isn't allergic to being carefree, being fun, and being hopeful, but rather a band that thrives on those three qualities. Their catchy pop-punk songs will be stuck in your head for days, their "fast paced acoustics" will remind you of a luau on the beach and will have you dancing around your room, and the general quality of their songs will mesmerize you and make you totally change your thoughts on exactly what music you should be connecting to. But the magic of King Charles's music is that it combines a carefree nature with serious art, it combines excitement and fun with creativity and art, and it combines hopeful happiness with mindful sensitivity. King Charles have pop-punk anthems, catchy and simple rock songs, ballads, and even some "beach" type songs. 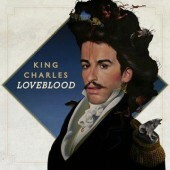 But the most important thing about King Charles is that they combine simplicity with art so well that just about anyone can connect to their catalog. And that in itself ends up being groundbreaking.